"This is a problem that exists in a culture that tolerates these behaviours." 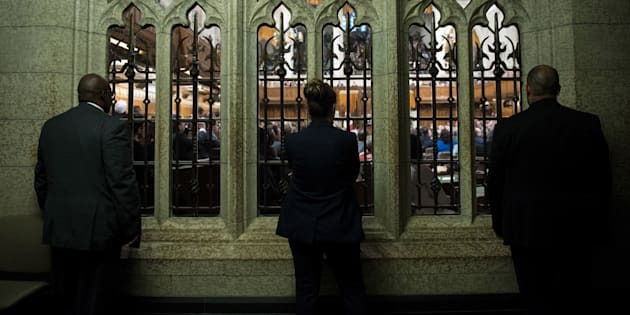 People listen from outside the chamber in the House of Commons on June 29, 2016 in Ottawa. OTTAWA — The federal government still has important details to iron out after it announced new legislation to take on the "full range of unacceptable behaviours," from teasing to sexual violence, in federally regulated workplaces. Labour Minister Patty Hajdu tabled Bill C-65 on Tuesday, proposing to make amendments to the Canada Labour Code to handle workplace harassment more efficiently. If passed, the legislation would extend across the House of Commons, Senate, and Library of Parliament. Those who work on Parliament Hill are currently not protected by the Canada Labour Code. But the government is limited in what it can do to prevent harassment and violence from happening on Parliament Hill, the minister said. "No government can legislate away this problem," said Hajdu. "This is a problem that exists in a culture that tolerates these behaviours, where power imbalances and gender norms create and reinforce all kinds of unacceptable behaviours." What the new legislation proposes to do is fuse two parallel complaint processes into one. Exclusive to that, the second piece of the plan is to facilitate a workplace culture change. So to make that cultural shift happen, the government has pledged to launch an awareness campaign, and to distribute education and training tools to employers and employees. The last promise is the creation of a helpline, a 1-800 number, to assist employers and employees through the complaint process. When asked about how much the awareness campaign and education tools will cost, Hajdu threw to the future for an answer. Patty Hajdu, Minister of Employment, Workforce Development and Labour stands during question period in the House of Commons on Parliament Hill in Ottawa on Sept. 19, 2017. "We'll have more to say about the funding in the days to come," she said. Hajdu made the announcement alongside Government House Leader Bardish Chagger, Status of Women Minister Maryam Monsef and chief government whip Pablo Rodriguez. Monsef called the timing of the new legislation "ideal," saying the #MeToo social media campaign has acclimatized people to listen and talk about instances of harassment more openly. "It's taken 150 years for us to introduce legislation like this," she said. The legislation will replace an array of current anti-harassment policies that apply to different groups of federal workers. For example, there's one that oversees MP complaints against other MPs. And there's another regime that applies only to federally regulated private-sector industries and Crown corporations. It would also implement measures to protect the privacy of complainants. The proposed consolidated workplace prevention and resolution process looks like this: if an employer does not resolve a complaint with the employee, the issue continues to mediation. If a resolution isn't found after mediation, a so-called "competent person" is brought in to investigate and produce an incident report that includes recommendations. "Competent people would have to be impartial. They would have to be trained and on the legislation they would have to understand the legislation. They would have to understand harassment and sexual violence," Hajdu said. She added an appointed competent person is chosen by the employer and employee. The Canadian Flag flies on a building in Ottawa across from the Peace Tower on Centre Block of Parliament Hill. "If the employer or the employee can't agree there will be a list of competent people that will be available from the labour program that people can choose from." After the report by the competent person is completed, it's then up to the employer to respond to it and implement its recommendations. And if the complaint is still not resolved at this stage, the labour minister would be brought in to investigate the case. The announcement comes in the wake of bombshell harassment and sexual abuse allegations against Hollywood producer Harvey Weinstein. Public condemnation over Weinstein's alleged decades-long pattern of sexual misconduct has refocused people's attention — especially employers — on implementing anti-harassment policies. What's missing from Bill C-65 is an explicit timeline for competent persons to complete incident and recommendation reports. The legislation is still a work in progress, Employment and Social Development Canada said. "The department will consult with stakeholders and experts during the regulatory process on the issue of timelines for the different steps in the process," department spokesman Christopher Simard said in an email. A HuffPost Canada investigation found that workplace harassment allegations against former Sen. Don Meredith were first reported to Senate human resources in July 2013. An official workplace assessment investigating the senator's office was launched in Feburary 2015 after late Sen. Pierre Claude Nolin noticed a high turnover in Meredith's office. Meredith resigned from the Senate earlier this year on the eve of an unprecedented expulsion vote over his sexual relationship with a teenage girl. That workplace assessment report, which the Senate Ethics Office pledged to complete despite Meredith's departure, remains unfinished. In the House of Commons, a report released last year said 10 cases investigating alleged harassment were processed in about a year. Ninety per cent of the complainants were female. The Canadian Labour Congress (CLC) and Oxfam Canada both released statements Tuesday applauding the government for taking a step in addressing the systemic issue. But both organizations flagged concerns with the promises being made with no explicit funding to match. "Effective legislation must be accompanied by sufficient financial resources and must come with comprehensive training that is sustained adequately over time," Oxfam Canada policy manager Diana Sarosi said in a release. "It is unclear at this point whether sufficient resources will be allocated to implement the regulations proposed in the bill." The CLC said it wants to see the bill include a "clear definition" of what constitutes harassment and violence under the proposed legislation. Bill C-65 has been a year in the making since the federal government launched consultations in mid-2016 to review the Canada Labour Code. When pressed by reporters for what the definition of "workplace" is, the labour minister said any work-related interaction inside or outside the office is subject to the new legislation. "So sometimes incidents happen after work," Hajdu said. "That doesn't mean it's still not workplace harassment."